"Some musicians take themselves too seriously. Psychostick knows just how to bring the badassery to the stage without sacrificing on all the fun." Psychostick is not your normal heavy metal band. There are a lot of different styles of metal, from nu metal to funk metal, death-doom to drone, and grindcore to even Nintendocore (yes, it's a thing). Chicago-based Psychostick is none of these, as the men of Psychostick have a very specific subgenre they subscribe to: humorcore. Really, it's a rather appropriate name for a band with songs titled "Beer," "Obey the Beard," and "Numbers (I Can Only Count to Four)." Ever since the band released its debut album We Couldn't Think of a Title, the quartet has caused equal amounts of head banging and belly laughing because, as their Facebook bio states, "the funny flows through them like the buffalo." 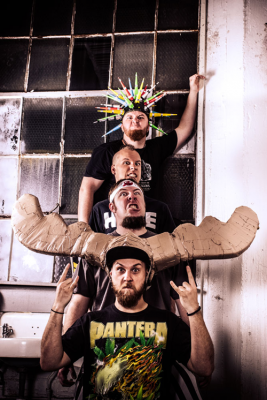 Fortunately for Erie metal heads and people who like things that make them happy, Psychostick will be putting on their usual musical antics at Basement Transmissions Sunday, Nov. 9. There, you can witness the humorcore movement for yourself and, y'know, laugh and enjoy some tight, awesome music and indulge in some giggle fits. Some musicians take themselves too seriously. Psychostick knows just how to bring the badassery to the stage without sacrificing on all the fun.